Article 1 - Classification and General Provisions. § 147-1. Public State officials classified. § 147-4. Executive officers – election; term; induction into office. § 147-5. Executive officers – report to Governor; reports transmitted to General Assembly. Article 2 - Expenses of State Officers and State Departments. § 147-7. Traveling expenses on State's business. § 147-8. Mileage allowance to officers or employees using public or private automobiles. § 147-9. Unlawful to pay more than allowance. § 147-9.1. Municipalities and counties exempt. Article 2A - Annuities and Deferred Compensation for Teachers and State Employees. § 147-9.3. Annuity contracts; salary deductions. § 147-9.4. Deferred Compensation Plan. § 147-10. Governor to reside in Raleigh; mansion and accessories. § 147-11. Salary and expense allowance of Governor; allowance to person designated to represent Governor's office. § 147-11.1. Succession to office of Governor; Acting Governor. § 147-12. Powers and duties of Governor. § 147-13. May convene Council of State; quorum; journal. § 147-13.1. Governor's power to consolidate State agencies. § 147-14. Appointment of private secretary; official correspondence preserved; books produced before General Assembly. § 147-15. Salary of private secretary. § 147-15.1: Repealed by Session Laws 1995, c. 379, s. 11. § 147-16. Records kept; certain original applications preserved; notice of commutations. § 147-16.1. Publication of executive orders. § 147-16.2. Duration of boards and councils created by executive officials; extensions. § 147-16.3. Timely nominations if legislative body must confirm. § 147-17. May employ counsel in cases wherein State is interested. § 147-18. To designate "Indian Day." § 147-19. To appoint a day of thanksgiving. § 147-20. Repealed by Session Laws 1955, c. 867, s. 13. § 147-21. Form and contents of applications for pardon. § 147-22. Repealed by Session Laws 1981, c. 309. § 147-23. Conditional pardons may be granted. § 147-24. Governor's duties when conditions of pardon violated. § 147-25. Duty of sheriff and clerk on pardon granted. § 147-26. To procure great seal of State; its description. § 147-27. Affixing great seal a second time to public papers. § 147-28. To procure seals for departments and courts. § 147-29. Seal of Department of State described. § 147-30. To provide new seals when necessary. § 147-31. Repealed by Session Laws 1983, c. 913, s. 48, effective July 22, 1983. § 147-31.1. Office space and expenses for Governor-elect and Lieutenant Governor-elect; and other Council of State members-elect. § 147-32. Compensation for surviving spouses of Governors. § 147-33. Compensation and expenses of Lieutenant Governor. Article 3A - Emergency War Powers of Governor. § 147-33.2. Emergency war powers of the Governor. § 147-33.3. Orders, rules and regulations. § 147-33.5. Federal action controlling. § 147-33.6. Construction of Article. §§ 147-33.7 through 147-33.11. Reserved for future codification purposes.  Article 3B - North Carolina Housing Commission. §§ 147-33.12 through 147-33.21: Repealed by Session Laws 1987, c. 841, s. 5. Article 3C - Office of Juvenile Justice. §§ 147-33.30 through 147-33.71. Repealed by Session Laws 2000-137, s. 1(a), effective July 20, 2000. § 147-33.72: Reserved for future codification purposes. Article 3D - State Information Technology Services. §§ 147-33.72A through 147-33.72F: Repealed by Session Laws 2015-241, s. 7A.2(a), effective September 18, 2015. § 147-33.72G: Repealed by Session Laws 2011-266, s. 1.9(a), effective July 1, 2011. § 147-33.73: Reserved for future codification purposes. § 147-33.74: Reserved for future codification purposes. §§ 147-33.75 through 147-33.77: Repealed by Session Laws 2015-241, s. 7A.2(a), effective September 18, 2015. § 147-33.78: Repealed by Session Laws 2004-129, ss. 4, 5. § 147-33.79. Repealed by Session Laws 2004-129, ss. 4, 5. §§ 147-33.80 through 147-33.84: Repealed by Session Laws 2015-241, s. 7A.2(a), effective September 18, 2015. § 147-33.85: Repealed by Session Laws 2004-129, ss. 17, 18, effective July 1, 2004. §147-33.86: Repealed by Session Laws 2004-129, ss. 17, 18, effective July 1, 2004. §§ 147-33.87 through 147-33.90: Repealed by Session Laws 2015-241, s. 7A.2(a), effective September 18, 2015. §§ 147-33.91 through 147-33.93: Repealed by Session Laws 2015-241, s. 7A.2(a), effective September 18, 2015. § 147-33.94. Reserved for future codification purposes. §§ 147-33.95 through 147-33.103: Repealed by Session Laws 2015-241, s. 7A.2(a), effective September 18, 2015. § 147-33.104: Repealed by Session Laws 2010-67, s. 1(a)-(d), effective July 1, 2010. § 147-33.104A: Repealed by Session Laws 2015-241, s. 7A.2(a), effective September 18, 2015. § 147-33.105: Reserved for future codification purposes. § 147-33.106: Reserved for future codification purposes. § 147-33.107: Reserved for future codification purposes. § 147-33.108: Reserved for future codification purposes. § 147-33.109: Reserved for future codification purposes. §§ 147-33.110 through 147-33.113: Repealed by Session Laws 2015-241, s. 7A.2(a), effective September 18, 2015. §§ 147-33.120 through 147-33.123: Repealed by Session Laws 2015-241, s. 7A.2(a), effective September 18, 2015. Article 4 - Secretary of State. § 147-34. Office and office hours. § 147-35. Salary of Secretary of State. § 147-36. Duties of Secretary of State. § 147-37. Secretary of State; fees to be collected. § 147-38. Repealed by Session Laws 1979, c. 85, s. 3. § 147-39. Custodian of statutes, records, deeds, etc. § 147-40. Repealed by Session Laws 1969, c. 1184, s. 8. § 147-41. To keep records of oyster grants. § 147-42. Binding original statutes, resolutions, and documents. § 147-43. Reports of State officers. §§ 147-43.1 through 147-43.3: Repealed by Session Laws 1969, c. 1184, s. 8. § 147-44. Repealed by Session Laws 1943, c. 48, s. 2. § 147-45. Distribution of copies of State publications. § 147-46. Repealed by Session Laws 1955, c. 987. § 147-46.1. Publications furnished State departments, bureaus, institutions and agencies. § 147-47. Repealed by Session Laws 1955, c. 748. § 147-48. Sale of Laws and Journals. § 147-49. Disposition of damaged and unsaleable publications. § 147-50. Publications of State officials and department heads furnished to certain institutions, agencies, etc. § 147-50.1. Repealed by Session Laws 1987, c. 771, s. 1. § 147-51. Clerks of superior courts responsible for Appellate Division Reports; lending prohibited. § 147-52. Transferred to § 7A-14 by Session Laws 1975, c. 328. § 147-53. Superseded by Session Laws 1943, c. 716. § 147-54. Printing, distribution and sale of the North Carolina Manual. § 147-54.1. Division of Publications; duties. § 147-54.2. Repealed by Session Laws 1979, c. 477, s. 2. § 147-54.4. Certification of local government property mappers. § 147-54.5. Investor Protection and Education Trust Fund; administration; limitations on use of the Fund. § 147-54.6. International relations assistance. § 147-54.7. Abrogation of offensive geographical place-names. § 147-54.7A: Repealed by Session Laws 2006-201, s. 19, effective January 1, 2007. Article 4A - Constitutional Amendments Publication Commission. Article 4B - Business License Information Office. §§ 147-54.11 through 147-54.19: Repealed by Session Laws 2004-124, s. 13.9A(a), effective July 1, 2004. §§ 147-54.20 through 147-54.30: Reserved for future codification purposes. Article 4C - Executive Branch Lobbying. §§ 147-54.31 through 147-54.44: Repealed by Session Laws 2006-201, s. 19, effective January 1, 2007. § 147-55: Repealed by Session Laws 1983, c. 913, s. 1. § 147-56. Repealed by Session Laws 1983, c. 913, s. 1, effective July 22, 1983. § 147-57. Repealed by Session Laws 1981, c. 884, s. 12. § 147-58. Repealed by Session Laws 1983, c. 913, s. 1, effective July 22, 1983. §§ 147-59 through 147-61. Repealed by Session Laws 1981, c. 302. § 147-62: Recodified as § 143-3.3 by Session Laws 1983, c. 913, s. 49. §§ 147-63, 147-64: Recodified as § 143-3.4 by Session Laws 1983, c. 913, ss. 50, 51. § 147-64.1. Salary of State Auditor. § 147-64.2. Legislative policy and intent. § 147-64.3. Legislative and management control system. § 147-64.5. Cooperation with Joint Legislative Commission on Governmental Operations and other governmental bodies. § 147-64.6. Duties and responsibilities. § 147-64.6A: Repealed by Session Laws 2012-142, s. 8.4, effective July 1, 2012. § 147-64.6B. Reports of improper governmental activities. § 147-64.6C. Cost of audit report published. § 147-64.6D. Cost of CPA audit report published. § 147-64.7A. Obstruction of audit. § 147-64.9. Rules and regulations. § 147-64.10. Powers of appointment. § 147-64.11. Review of office. § 147-64.12. Conflict of interest. § 147-65. Salary of State Treasurer. § 147-66. Office and office hours. § 147-67. Repealed by Session Laws 1981, c. 884, s. 14. § 147-68. To receive and disburse moneys; to make reports. § 147-68.2. Confidentiality of warrants issued by the State. § 147-69. Deposits of State funds in banks and savings and loan associations regulated. § 147-69.1. Investments authorized for General Fund and Highway Funds assets. § 147-69.2. Investments authorized for special funds held by State Treasurer. § 147-69.2A. Investments; special funds held by the State Treasurer. § 147-69.3. Administration of State Treasurer's investment programs. § 147-69.3A. Liability insurance for State Treasurer. § 147-69.4: Repealed by Session Laws 2010-175, s. 5, effective July 1, 2010. § 147-69.5. Local Government Law Enforcement Special Separation Allowance Fund. § 147-69.6. Swain County Settlement Trust Fund. § 147-69.7. Discharge of duties to funds. § 147-69.8. Annual report on new investment authority. § 147-69.9. Third-party audit of State Treasurer's investments. § 147-69.10. Investment policies and performance reviews of Retirement Systems investment programs. § 147-69.12. Reporting on the State Treasurer's investment programs. § 147-70. To make short-term notes in emergencies. § 147-71. May demand and sue for money and property of State. § 147-72. Ex officio treasurer of State institutions; duties as such. § 147-73. Office of treasurer of each State institution abolished. § 147-74. Office of State Treasurer declared office of deposit and disbursement. § 147-75. Deputy to act for Treasurer. § 147-76. Liability for false entries in his books. § 147-77. Daily deposit of funds to credit of Treasurer. § 147-78. Treasurer to select depositories. § 147-78.1. Good faith deposits; use of master trust. § 147-79. Deposits to be secured; reports of depositories. § 147-80. Deposit in other banks unlawful; liability. § 147-81. Number of depositories; contract. § 147-82. Accounts of funds kept separate. § 147-83. Receipts from federal government and gifts not affected. § 147-84. Refund of excess payments. § 147-86. Additional clerical assistance authorized; compensation and duties. § 147-86.1. Pool account for local government unemployment compensation. § 147-86.2. Information Technology fees; dispute resolution panel. § 147-86.3. Reserved for future codification purposes. § 147-86.4. Reserved for future codification purposes. § 147-86.5. Reserved for future codification purposes. § 147-86.6. Reserved for future codification purposes. § 147-86.7. Reserved for future codification purposes. § 147-86.8. Reserved for future codification purposes. § 147-86.9. Reserved for future codification purposes. Article 6A - Cash Management. § 147-86.10. (Statement of policy. § 147-86.11. Cash management for the State. § 147-86.12. Cash management for school administration units. § 147-86.13. Cash management for community colleges. § 147-86.14. Cash management for the General Court of Justice. § 147-86.15. Cash management of the Highway Fund and the Highway Trust Fund. §§ 147-86.16 through 147-86.19. Reserved for future codification purposes. Article 6B - Statewide Accounts Receivable Program. § 147-86.21. State agencies to collect accounts receivable in accordance with statewide policies. § 147-86.22. Statewide accounts receivable program. § 147-86.23. Interest and penalties. § 147-86.24. Debtor information and skip tracing. § 147-86.25. Setoff debt collection. § 147-86.28. Reserved for future codification purposes. § 147-86.29. Reserved for future codification purposes. Article 6C - Health and Wellness Trust Fund. § 147-86.30: Repealed by Session Laws 2011-145, s. 6.11(a), effective August 14, 2011. § 147-86.31: Repealed by Session Laws 2011-145, s. 6.11(a), effective August 14, 2011. § 147-86.32: Repealed by Session Laws 2011-145, s. 6.11(a), effective August 14, 2011. § 147-86.33: Repealed by Session Laws 2011-145, s. 6.11(a), effective August 14, 2011. § 147-86.34: Repealed by Session Laws 2011-145, s. 6.11(a), effective August 14, 2011. § 147-86.35: Repealed by Session Laws 2011-145, s. 6.11(a), effective August 14, 2011. § 147-86.36: Repealed by Session Laws 2011-145, s. 6.11(a), effective August 14, 2011. Article 6D - Sudan (Darfur) Divestment Act. § 147-86.43. Identification of companies. § 147-86.46. Expiration of this article. § 147-86.47: Repealed by Session Laws 2017-193, s. 2.5, effective October 1, 2017. § 147-86.48: Repealed by Session Laws 2017-193, s. 2.5, effective October 1, 2017. Article 6E - Iran Divestment Act. § 147-86.58. Prohibitions on State investment. § 147-86.59: Repealed by Session Laws 2017-193, s. 3.4, effective October 1, 2017. § 147-86.60. Restrictions on contracts with the State or subdivisions of the State. § 147-86.63. No private right of action. § 147-86.64: Reserved for future codification purposes. § 147-86.65: Reserved for future codification purposes. § 147-86.66: Reserved for future codification purposes. § 147-86.67: Reserved for future codification purposes. § 147-86.68: Reserved for future codification purposes. § 147-86.69: Reserved for future codification purposes. Article 6F - Achieving a Better Life Experience Program Trust. § 147-86.72. ABLE Program Board of Trustees. § 147-86.73. Administration of ABLE Program. § 147-86.74: Reserved for future codification purposes. § 147-86.75: Reserved for future codification purposes. § 147-86.76: Reserved for future codification purposes. § 147-86.77: Reserved for future codification purposes. § 147-86.78: Reserved for future codification purposes. § 147-86.79: Reserved for future codification purposes. Article 6G - Divestment From Companies Boycotting Israel. § 147-86.81. Prohibitions on State investment. § 147-86.82. Restrictions on contracts with the State or subdivisions of the State. Article 7 - Secretary of Revenue. § 147-87. Secretary of Revenue; appointment; salary. § 147-88: Repealed by Session Laws 1991, c. 10, s. 3. Article 8 - District Attorneys. § 147-89. To prosecute cases removed to federal courts. § 147-90. Investigations of uses of deadly force.